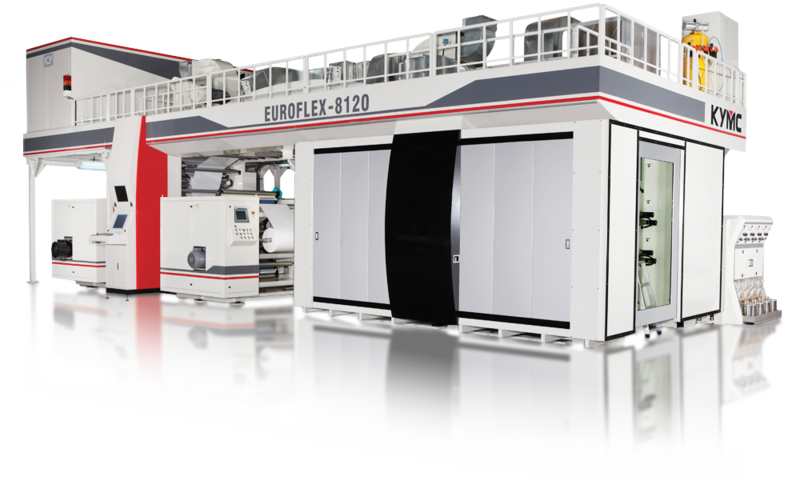 "Innovative CI tailored to your needs"
The EUROFLEX is KYMC's most advanced next generation (2011) High Speed Gearless CI Flexo Press built on a vibration dampening Mono-block heavy duty platform. The Mono-block frames are 4" thick for 8 and 10 colors for speeds up to 1500 FPM. Euroflex the latest European standard gearless flexo press is argueably the best value to quality gearless press in the market, pairing modern European components and design with smart Taiwan technology at affordable equipment that allow you to stay in the competitive edge. The press is equipped with advanced automatic register preset system as well as the automatic print pressure setting for reduced waste. The Euroflex integrates a new generation computerized job management system which incorporates auto deck position control, auto print sleeve ejection system and auto wash system, makes Euroflex one of the fastest change machines in the market. The reduced set up time also minimizes waste making it ideal for both short and long production runs. All major components on the press come from European suppliers such as Central Drum, servo drives, PLC and controls etc, guaranteeing reliable machine performance for long term. The EUROFLEX is built with the same precision and technology from our experience building the gearless and CNC while making additional improvements. All printing stations are controlled with a high degree of accuracy to ensure excellent printing quality and a good price/value ratio on your investment. Most of the press components are either manufactured in the US or available through US subsidiaries such as Rexroth/Indramat and PLC programmable controls by Simens. The Euroflex complies fully with OSHA and CE standards. Operator friendly designed touch screen operation. Flying splice operation at maximum speed. Air shafts with safety chucks for easy change over. Available for 600mm, 800mm and 1000mm roll diameter. The modern monoblock design is made from thick 4" single block molds that minimize traditional block sections. The mass sections run the length of the CI drum and decks to significantly reduce vibration at all speeds while facilitating quick change over windows. In addition, stablizing printing deck bars are solidly joined between either side of the monoblock design to additionally decrease vibration to a minimum for the most accurate registration at higher speeds. Deck positioning is precise to 1 micron through direct coupling servo motors, with simultaneous sleeve changes of the print and anilox rollers including an automatic push out feature for quick change overs helpful for short runs. Motor cross bars are eliminated by the individual deck motors, AC servo, that directly connect to the ball screws via couplings. Euroflex uses a Direct Drive Central Drum via torque motor from Rexroth/Indramat, for extreme precision to the direct AC servo drives (Indramat) on both the plate and anilox sleeve mandrels to guarantee the best print register tolerance during running. Full servo drives on each print stations and are controlled through industrial network system, providing extreme accurate control on print registration and impression control. The Euroflex uses the latest automatic pre-register and setting system by BST Eltromat using the webvideo fast flexo Profibus-interface for reduced waste. The Euroflex uses both an automatic pre-register and auto impression setting system by integrating the Eltromat star 2000 system for reduced waste. The auto set technology automates the ink deck setting for plate and anilox rollers simultaneously, saving hundreds of feet of waste during press start up. Fully integrated and optimized sequence of ink deck setting with length and side register control. The final print position can be saved for repeat production. The drives will be activated for "Home searching" automatically after the saved print position is recalled. This is a more compact press than the Euroflex, yet is built for easy operation, affordability and still highly automated. Phoenix flexo compact press aims to help you remain competitive, given the market trends towards shorter runs and smaller packaging sizes. If you are seeking for a smaller footprint gearless press, we can customize it to your requirements. The Flexojet is a geared press, but equipped with servo motors at the print deck to allow for print precision. The press provides excellent print quality at a decent press speed for budget-focused runs. This press is suitable for experienced operators that are looking for more precision in the print deck control. Thank you for your interest. Our team will be in contact with you shortly.